Different people have different ideas on what constitutes the perfect practise session. Some are happy to arrive at the dojo, have a quick stretch, put their men on and enjoy an hour’s jigeiko. Others may prefer to concentrate on kihon drills for the whole session. In my view there is no right answer. The way you structure your keiko depends on how much time you have to fill and the level and physical condition of those taking part. If you are lucky enough to have a number of kodansha in the dojo, then jigeiko can be a great learning experience. To be more precise what you are getting is hikitate-geiko, where sensei is taking a view of your strengths and weaknesses and stretching you to do a bit better. If there is one instructor teaching a class of students then a structured session built on demonstration and repetition is likely to be the best way forward. The length of your training session also dictates what you do. My ideal kendo week would consist of five or six 45 minute to one hour practices, each conducted at maximum intensity. When you have two or 3 hours to fill, you need to bring in more variety and exercises that offer a change of pace. For example, start with kata or boken ni yoru kihon keikoho, move on to kihon drills, keeping them short and changing partners frequently and finally move to jigeiko. With kihon drills it’s best to keep to a theme. It might simply be improving ki-ken-tai-itchi, or could be something more ambitious like incorporating seme into the attack. You can work on shikake-waza one day and oji-waza on another, or you could practise men attacks and the oji-waza to use against them as part of the same session. In drills like this it is important for both motodachi and kakarite to approach each technique with total commitment and not anticipate the others movement, otherwise you are in danger of producing the counter attack before the attack. One other word of warning, don’t try to do too much. 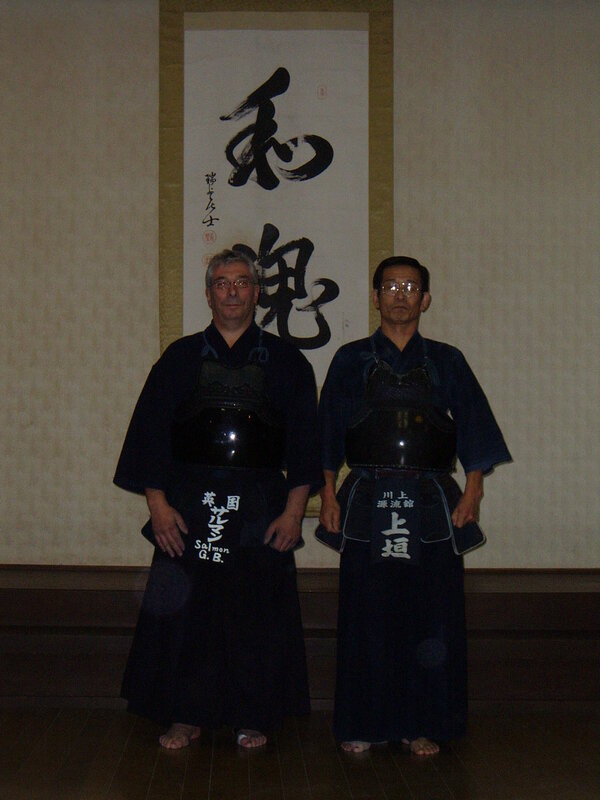 I have seen sessions which have included almost every technique in kendo. In this case it is difficult to remember what you have covered, let alone get any benefit from it. However you approach each training session remember that the purpose is to improve your kendo, and to enjoy your time in the dojo. I had an interesting conversation with Uegaki-sensei during my last trip to Japan. He made the point that if you want to improve a technique then you should work on it exclusively for 3 months. This makes a great deal of sense. If you focus exclusively on one waza for this length of time you are going to absorb it into your muscle memory and it is going to become second nature when you deploy it in keiko or shiai. The only word of warning is that you need to practice the technique correctly. Constantly repeating a mistake will only magnify it, so you need to be fairly certain that you understand exactly what you are doing before you commit yourself to 3000 repetitions per day. 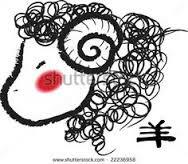 The best way to improve is through kihon drills, but it is difficult to focus these exclusively on your own needs. In most dojo the training exercises are prescribed by an instructor whose job is to build a training programme that is valuable to everyone in the dojo. Often though if you tell your sensei what you are trying to do, he will set aside some practice time to help you, and you will have the bonus of him helping you get it right. I sometimes use motodachi-geiko sessions with students to work exclusively on the points that they are struggling with. If sensei is not able to, or available to help, then it may be worth going to the dojo early with a buddy and working together on one technique, or taking turns to act as a target for different waza that you each need to work on. I know a number of people who have gone to the trouble of renting squash courts so they can spend some quality time developing their tokui waza. What takes more discipline is to use your time in jigeiko to focus on one particular technique. Going into a keiko with the intention of only hitting men is commendable, but if all of your opponents are head and shoulders taller than you, it is difficult not to switch to dou of kote. Perhaps a better way is to set a goal of trying a particular technique a given number of times with each partner. There is of course a strong likelihood that everyone will catch on to you plan and make it more difficult for you to achieve your aim, but that resistance can also be used to improve. A number of newer students recently asked about the difference between uchikomigeiko and kakarigeiko. On asking them what they thought the difference was, many of the answers focused on speed. This is not surprising. People often see kakarigeiko as a series of fast and furious full-on attacks and uchikomigeiko as a more sedate affair. This is plausible but not the right answer. The difference is about whom, not how fast. In uchikomigeiko it is motodachi who makes the opportunities for kakarite to attack. The purpose is to give clear targets and indications of timing and opportunity to allow the attacker to strike the target correctly without fear of counterattack or of running onto the point of a shinai. Uchikomigeiko is often one of the first training methods that new kenshi try, either with a motodachi in bogu, or with one person in the centre of the dojo holding a shinai or uchikomi-bo for them to strike as they move through in turn. For the more experienced, uchikomigeiko can be the simple practice of one technique such as men with partners taking turns at being motodachi, through to more complex sequences with seniors or instructors receiving the attacks. A typical sequence is men, kote, dou, kote-men, kote-dou, men-hiki-men, men. Kakarigeiko probably suits more advanced students. They have to make the opportunities to attack, either making strong seme with their body and mind or the point of the shinai, or by knocking the opponent’s shinai away with harai or uchiotoshi before striking. If you do not have good basic kendo with correct cutting, posture and ki-ken-tai itchi, kakarigeiko is likely to do more harm than good. On the other hand if you have mastered the basics, kakarigeiko is an opportunity to practise your techniques flat-out with total commitment. It is however essential that you trust motodachi. Motodachi’s job is to keep you honest. He should ensure that only correct attacks made with strong seme should get through. He has a number of tools available to do this, he can just hold kamae, or use his own harai or uchiotoshi waza to break weak attacks. Poor posture can be punished with taiatari and he can respond to kakarite’s unsuccessful attacks with oji waza. What he must never do is to endanger or injure kakarite with techniques such as mukaetsuki. This will have a wholly negative effect, making kakarite afraid to attack wholeheartedly. Kakarigeiko should be fast and done with correct breathing, so for renzoku waza you should try to make each attacking sequence in one breath. It is not however just reserved for the young and fit. We oldies can make up for the lack of pace with strong kiryoku. The Christmas and New Year holidays mean kendo down-time for many of us. Here are some practical tasks that might help improve our kendo to try over next few days, before we get swept up in the pleasant routine of next year’s keiko. Wash your hakama and keikogi – I am a long term fan of the Japanese ritual of Osoji, making sure that everything is clean and in good order for the coming year. Starting the year with clean dogi feels like a fresh beginning to your keiko. Make sure shinai and bogu are in good condition – Check take, tighten tsuru and nakayui and replace old himo on bogu. Treat yourself to a pedicure- buy a foot file, or better still get a professional chiropodist to remove the callouses and hard skin inflicted on your feet by last year’s training. If you miss them don’t worry, you will soon be able to build up another set of kendo hooves. Find a role model – Think about teachers and senshu whose kendo you admire, ideally find someone with similar physical characteristics to your own. Look at their kendo on YouTube or read anything they have written about their own kendo philosophy and training habits and choose elements to introduce into your own practice. Practice suburi at home– Chiba sensei in his all-Japan prime used to do 3,000 continuous suburi every day, a few hundred would be a worthwhile activity for most of us. Words of warning –buy a short suburi shinai or watch out for low ceilings and light fittings. We don’t want to alienate our nearest and dearest at this time of year. Practice breathing – I don’t mean the standard life sustaining in and out stuff, but kendo chokoki tanden kokyu, breathing in deeply and holding the air in your tanden before breathing out quickly through your mouth. Ideally you should do this sitting in seiza. 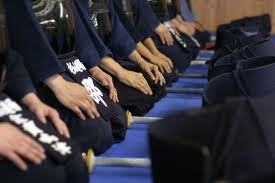 Analyse your kendo – think about your keiko over the past year and the elements that felt “right”. Reflect on advice you have received and try to filter out any contradictions. 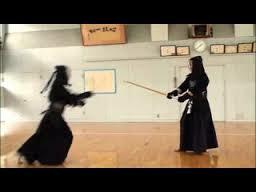 If you have video footage of your kendo look at it in detail and try to understand the points that you should work on. And that’s it! Another kendo year nearly over! Thank you for reading my blog in 2014. For local kendo friends, I hope to see you at Sanshukan on Tuesday, I also look forward to meeting up with international friends in Brussels, Tokyo and various other locations over the course of 2015. Rainen mo yoroshiku onegaishimasu. Have a great kendo year. Last year I asked my friend Yukiko Ayres to produce some calligraphy for a new tenugui for my Thursday dojo, we decided to use the characters ki shu bu shin, which allude to the fact that training should be fierce and rigorous but that the intention behind it is benign. “Devil hands, Buddha Heart” is a very loose translation. The reason for adopting this motto is my belief that keiko should be stretching and strenuous and that motodachi’s role is to help shidachi reach up to the next level. As a young kendoka in Japan my keiko with most of the senior teachers usually consisted of ippon shobu, which I never ever won, immediately followed by kakarigeiko of varying length and intensity. Each sensei seemed to have his own formula for correcting some of my many weaknesses. In most cases the plan was to take me to a level of exhaustion where I was no longer able to remain tense or to use shoulder strength to raise the shinai. Going through this process in Japanese summer humidity usually left me in a soggy heap. The fact that there is usually a fifteen minute queuing time between hanshi is probably the reason I survived to tell the tale. Whether I was suffering from Stockholm syndrome, or acting like one of the victims of Monty Python’s fictitious gangsters, Doug and Dinsdale Piranha, who showed mercy by nailing hands to coffee tables instead of heads to the floor, I am not sure, but I certainly came away from these sessions with a feeling of gratitude rather than resentment. Now when I get the occasional chance to train with my betters, I am still expected to stretch myself despite my advanced state of decrepitude. More of my time however is spent receiving kakarigeiko where the main challenge is to decide how intensive kakarigeiko should be for each individual. The kenshi that I train with are of varied ages and physical fitness levels. 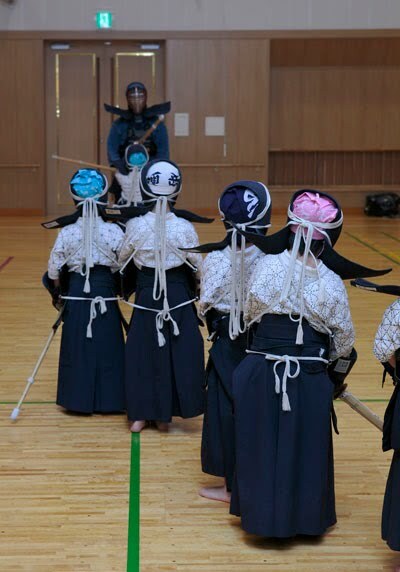 They come to kendo through their own free will and have not signed up to be punished in boot camp, so training needs to be enjoyable as well as effective. I try to tailor each motodachi keiko session to a length and intensity to fit each student. A young national team member will have a longer faster session with more resistance than a middle aged student and for an older member two or three good uchikomi attacks are probably sufficient. Still from time to time I look at the kanji on our tenugui and think affectionately about some of the sensei, sadly no longer with us, who had mastered the art of sending you home with just enough resentment to make you determined to come back and do better tomorrow.